WASHINGTON, DC, November 6, 2011 (ENS) – On Sunday, an estimated 12,000 people surrounded the White House in circles at least three deep, demanding that President Barack Obama deny a permit for the TransCanada’s Keystone XL tar sands oil pipeline to cross the U.S.-Canada border. President Obama was not in the White House. After returning from the G20 meeting in France, he was playing golf at Fort Belvoir. Because the US$7 billion, 1,700-mile oil pipeline would cross the U.S.-Canada border carrying tar sands oil from northern Alberta to refineries in Texas, the President must determine whether or not it is in the national interest. 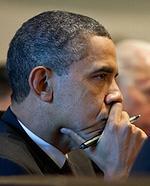 Until this week, President Obama had passed that decision to the State Department. But the administration is facing mounting pressure from those who say extracting, transporting and burning the heavy tar sands oil would harm the environment. 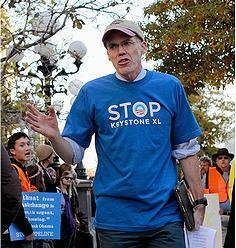 “Tar sands oil is the dirtiest oil on Earth,” said Michael Brune, executive director of the Sierra Club. Also lobbying against the pipeline are Nebraska ranchers and farmers who fear pipeline spills would pollute the Ogllala aquifer, which supplies drinking and irrigation water to many of the Great Plains states. The pipeline would bisect the Sandhills of Nebraska, 1.3 million acres of wetlands and home to more than 1,000 species of mammals, birds, fish, and plants, which would be harmed in the event of an oil spill. Finally, the environmentalists contend, the pipeline would “accelerate the refining of the gooey toxic tar sands oil, which generates more global warming pollution per barrel than conventional oil,” Krupp explained. Obama’s re-election depends in part on his ability to energize his supporters, but many environmentalists who supported him in 2008 are disappointed with his progress in accomplishing environmental goals. 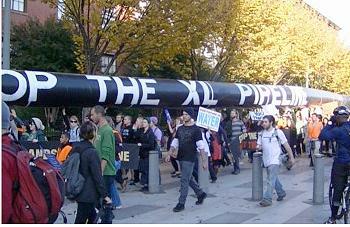 The Keystone XL pipeline has been a focus for their discontent. A two-week long series of demonstrations in front of the White House in August and September resulted in the arrests of more than 1,200 people, including high-profile scientsts and faith leaders. More than 6,000 people already have signed up to form a human protest circle around the White House on Sunday. Fifteen Democratic lawmakers upped the political ante October 26 with a letter asking the State Department’s Office of the Inspector General to probe whether the department’s review of the proposed pipeline has been polluted by conflicts of interest. 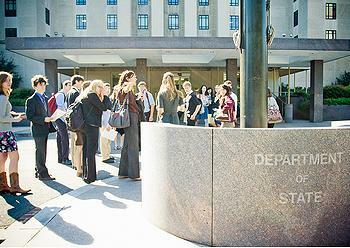 The 15 legislators, led by Senator Bernie Sanders, a Vermont Independent, and Congressman Steve Cohen of Tennessee, ask State Department Deputy Inspector General Harold Geisel to review whether TransCanada may have improperly influenced the State Department’s selection of a contractor for the Environmental Impact Statement, EIS. The legislators expressed concern that the State Department allowed TransCanada, the pipeline developer, to screen applicants to conduct the EIS, which is required by federal law. TransCanada successfully recommended that the State Department select Cardno Entrix to conduct the EIS, despite Cardno Entrix listing TransCanada as a “major client” and Cardno Entrix having a pre-existing financial relationship with TransCanada. “On its face alone, this creates an appearance of a conflict of interest,” the legislators wrote. “Given the significant economic, environmental, and public health implications of the proposed pipeline, we believe that it is critical that the State Department conduct thorough, unbiased reviews of the project,” states the from lawmakers, including Senators Ron Wyden of Oregon and Sheldon Whitehouse of Rhode Island. On October 28, a dozen national environmental groups called for an investigation by the State Department’s inspector general. The groups sent Deputy State Department Inspector General Harold Geisel a letter identifying several U.S. Office of Government Ethics regulations that State Department officials appear to have violated. They worry about the relationship between TransCanada lobbyist Paul Elliott and State Department officials. Elliott was deputy campaign manager for the 2008 presidential campaign of Secretary of State Hillary Clinton. The groups are also concerned about the recent hiring of former TransCanada lobbyist Broderick Johnson to be a senior adviser to Obama’s re-election campaign. Brune said the decision-making process has been tainted. “The State Department has demonstrated a conflict of interest and deep pro-industry bias, mismanaging the environmental review and public input process,” he said. Nebraska Governor Dave Heineman, a Republican, has called a special legislative session to consider rerouting the proposed pipeline around the Ogllala aquifer. The session, which opened on November 1, is to consider giving Nebraska authority to say where TransCanada’s proposed Keystone XL oil pipeline goes through the state. At least five bills have been proposed. Industry experts say the Alberta tar sands will be developed, whether the oil comes to the United States or is shipped elsewhere, so U.S. rejection would not benefit the environment. 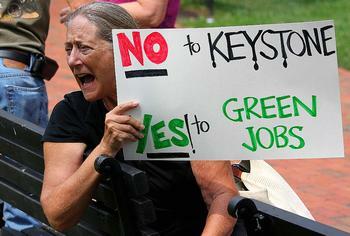 If Obama approves the pipeline, he will lose environmentalist support. That could affect the 2012 election by making it difficult to mobilize people to volunteer, knock on doors and donate money, if they believe the President cannot stand up to polluters.